The late summer perennial Aconite (or Aconitum) gets a pretty bad write-up in most gardening books. Of course, its sap is poisonous. It has been used throughout the ages for what my book of garden perennials describes as 'deliberate poisoning'. Eeek! Aconitum also has the common name Monkshood. The hooded blue flowers have quite a dramatic look, and do look like hoods when seen close-up. Another name for Aconitum in my gardening book is Wolfsbane. I'm not sure what this signifies - is it possibly a reference to being poisonous? This is certainly a colourful perennial, as far as names go! 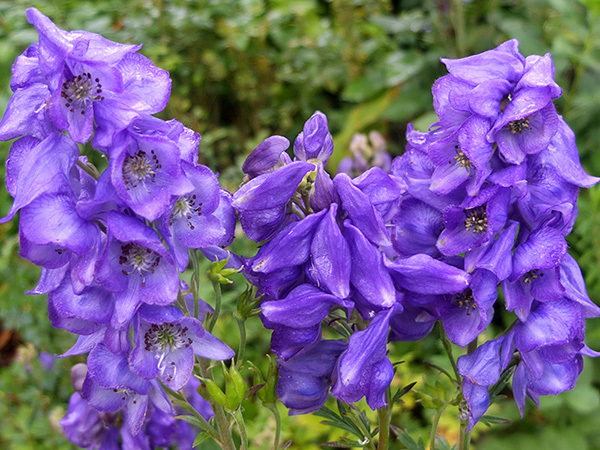 Aconitum has beautiful deep blue flowers which appear in mid-summer and stay blooming throughout autumn. At any time of year blue flowers are very welcome, particularly those that flower in a reasonably sized clump. And blue is my favourite colour, after all. In fact, from a distance a patch of Aconitum flowers can look like blue delphiniums. At least it does for Head Gardeners with dodgy eyesight who don't wear their spectacles in the garden! But of course the season of flowering is different. 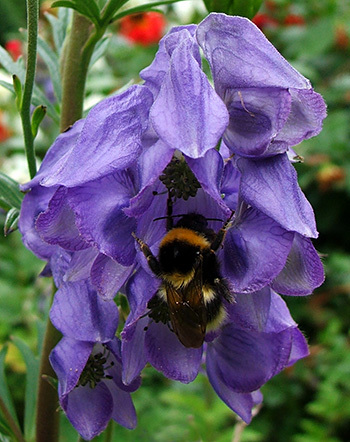 And, like Delphiniums, Aconitums are beloved by the bumble bees. They can often be found dozing inside the flowers. A good sized clump of Aconitums grows in the house garden, and the flowering coincides with the second flush of my Mary roses. Deep blue and pink - such a pretty colour combination.